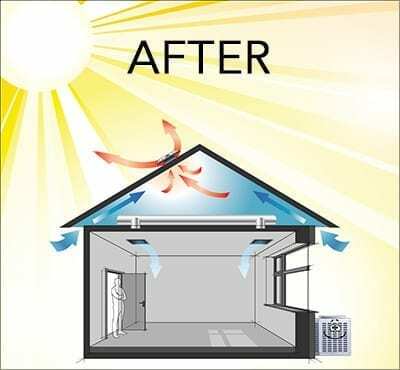 SunRise Solar Fans can save you on your cooling costs! This unit is designed for attic spaces between 2000-2400 square feet and has a 30 watt – 1600 CFM motor. The tilt option is only available for the 1600 model. Curb Base: 20.25″ x 20.25″; Unit Weight: 15 lbs. “SunRise 850” – 16 lbs. “SunRise 1050” – 18 lbs. “SunRise 1250” – 18 lbs. or you can add one to an existing fan. Attic temperature rises to 80° and fan turns on. Once it cools to 65° the fan will shut off. 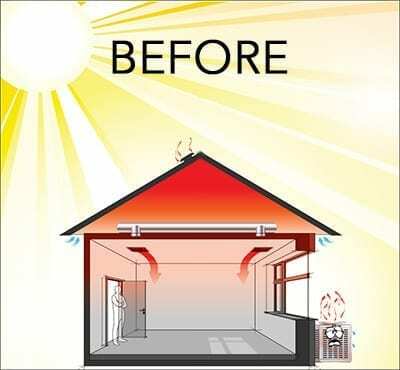 If evening comes and temp does not fall below 65° to reset the switch, then the unit will start the next morning at sunrise and continue to cool the attic. If the attic temp falls below 65° at night, then the switch will shut off and will not turn the unit on again until attic temp reaches 80°. 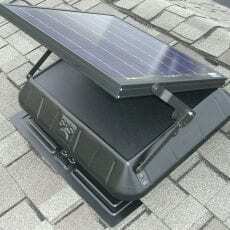 The SunRise™ is a unique, solar-powered vent fan that pulls the heat right out of your attic. It’s so effective it can lower attic temperatures by as much as 50°! It is a great compliment to Energy Attic Aluminum Foil flushing the heat from the aluminum with the air movement created by the fan. In the wintertime, the SunRise™ helps equalize the temperature between the attic inside and the outside air. This dramatically reduces the risk of ice dams forming at the eaves – a feature that could save you thousands. Reduces moisture build-up and prolongs the life of your roof. Even in newer homes that use vapor barriers, moisture can still sneak into the attic and condense on framing boards, roof decking, and insulation. SunRise™ forcibly expels this warm, moist air, helping prevent the growth of mold and mildew, and significantly reducing the chance of rotting the roofing materials. SunRise™ uses the most advanced solar panels to collect and deliver power directly from the sun to our highly efficient 12-volt DC motor inside the power vent. With its 12”, balanced-hub, aluminum fan blade, the SunRise™ forcibly expels hot air, providing fresh, cool air to keep your attic from overheating! Our tough, weather-resistant panels collect solar energy even in reduced light and poor weather conditions and provide maximum cooling effect when it’s needed most — in the middle of the day. The SunRise fans operate without fuel, waste, or pollution and are wind, hail, and impact resistant. All SunRise™ Solar Fans come fully assembled and can be installed in under an hour. All without costing you a penny to operate!